So, in the interests of actually blogging (with pictures…) before even more time passes, I’m officially ignoring what day of the week it is (I’ve been turned around so many times the only way I now know what day it is is because I’m dogsitting). I also forgot to take crafting pictures before I left Bristol, so instead you’re all going to get my Salisbury crafts. Starting with this giant blanket. I tend not to do anything straight when I can help it, so this is deliberately knit diagonally (or as close to diagonally I can get without turning it into mitred squares). The other main WIP I have here is the butterfly fairy. I’m working this right to left because the pattern is too wide for the scroll rods. It’s going to take agessss to finish (see reasons above). But it’s kinda hard to mind enough to actually move this to Bristol because it’s so big and would still take ages to finish. This way I get to pretend to myself that it would get finished earlier if I actually worked on it…Please note that isn’t actually the bottom yet…this thing is BIG. And those are my two WIPs in Salisbury. Quite often I bring other projects (like the cross stitch seagull I brought this time), but they really *live* in Bristol and travel with me, whereas these two stay in Salisbury all the time. Next time while I’m still here I might show off what stash is here as a reference for myself! I also promised a look at the bag of scraps I have on Friday. Who here does scrappy projects? How do you manage to keep the number of ball ends under control??? Any tips to share? Do you go for approximate number of squares, or number of balls or some other system? 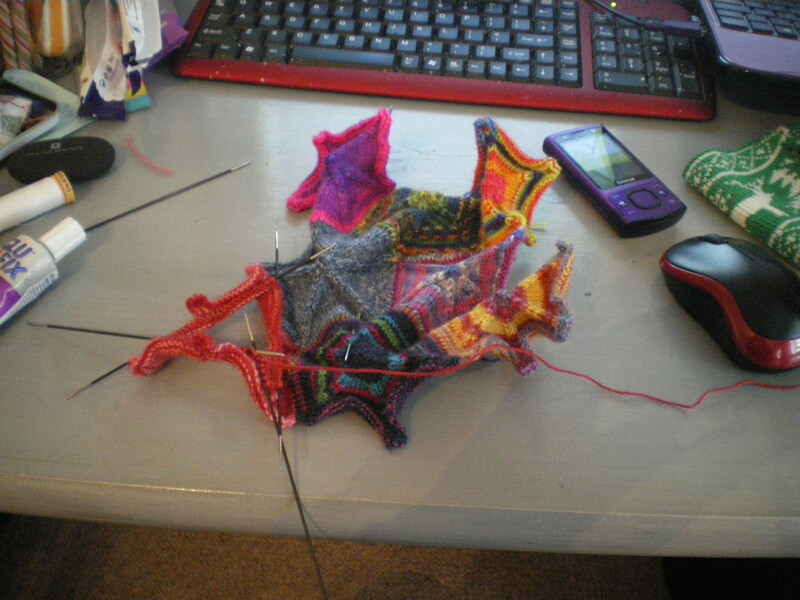 Or jsut not worry about it and if you run out you knit some other things? I am knitting a scrappy sock-yarn blanket using hexagons (this pattern on ravelry). You cast on/pick up stitches, and then knit from the outside in to make hexagons. You finish by cutting the yarn, drawing it through the stitches (like for hats), and then secure the yarn on the WS. There are lots of different possibilities for scrap projects (mitred squares, hexagons, hexipuffs, apple cores…), but I decided on hexagons after a bit of thought. I didn’t want to pay for hexipuffs, and even though I could probably have come up with a version by myself, I didn’t want it stuffed. I want a blanket rather than a quilt/duvet. I didn’t like the way you keep adding to the blanket for mitred squares, rather than being able to make some on the go and add them later, and I didn’t like the sewing for apple cores. With this hexagon pattern, the plan is to make sets of 3 rows, and then attach them at home with another row of hexagons. It will also be easy to replace individual parts when they start wearing, again without any sewing! So far I have 7 and a bit hexagons, and it takes me just over a day to make one. That will drop when I get my act together and start on Christmas presents, but still!